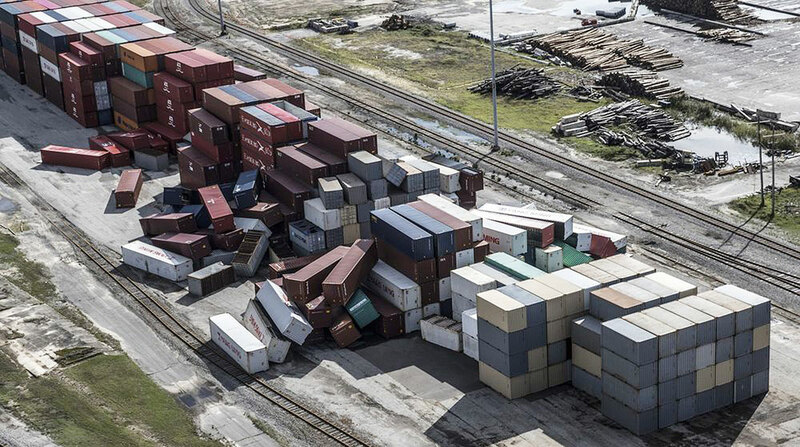 The ports of Wilmington and Morehead City in North Carolina have reopened with restrictions to marine traffic after Hurricane Florence swept through late last week, halting shipments of everything from fertilizer to textiles. Florence dropped as much as 40 inches of rain in some places as it passed over Wilmington on its way through North and South Carolina. Several major surrounding highways were flooded, limiting access to the coastal city and the port. The U.S. Coast Guard said Sept. 19 that both ports resumed service the evening of Sept. 18, with activity limited to daylight operations, among other restrictions. The port said Sept. 18 that it plans to resume truck operations Sept. 24. A 2014 study showed that goods moving through Wilmington contributed about $12.9 billion annually to North Carolina’s economy while directly and indirectly supporting 73,000 jobs. In 2016, the port received nearly 1,500 ships totaling 5.4 million short tons of cargo. The biggest products it handles include nitrogenous fertilizer, pulp and wastepaper, textile products, wheat and gasoline, which account for about one-third of the total. “A number of very large companies down there [are] impacted,” said John Loyack, vice president of global business services for the Economic Development Partnership of North Carolina. One company, Enviva Partners, makes wooden pellets used to run industrial furnaces, and ships products from Wilmington to Europe. The pellets are stored in giant, white domes at the port. In a statement, Enviva said its Wilmington terminal will be able to receive pellets later this week as the port reopens. The company said it expects “modest impacts” to its shipments from Wilmington because of the hurricane. Another company with a presence at the port, National Gypsum, didn’t respond to a request for comment. The storm interrupted tankers and barges that bring gasoline and diesel fuel into the area. About 62% of gas stations in Wilmington were without fuel Sept. 18, according to GasBuddy. The Port of Wilmington is designated as a Foreign Trade Zone offering reduced, deferred or no import duty for the goods it handles. It is among the nation’s top 25 ports by TEU (20-foot equivalent unit).